Vintage style misses accessories by Andrea Schewe. 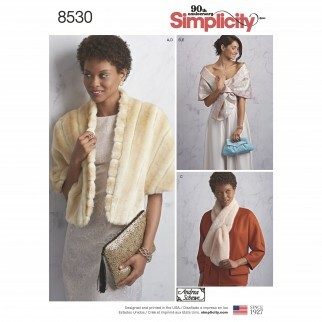 Pattern features a faux fur stole, a pull through shawl, pull through scarf, and two clutches. Pull through scarf can be made in faux fur and pull through shall can be made in a lovely satin or velvet. Make a matching clutch in satin or velvet or add some pizzazz to your outifit with a clutch made in novelty sequin. Both clutches are made with zipper closure. Andrea Schewe Design for Simplicity sewing patterns.